Lakeside 489 Medium-Duty Stainless Steel Three Shelf Tubular Utility Cart with Chrome-Plated Legs / Frame - 27" x 20" x 35"
Perfect for all-purpose, back-of-the-house chores, this Lakeside 489 stainless steel three shelf utility cart with chrome-plated legs and frame boasts outstanding versatility and durability for all your routine transport tasks. 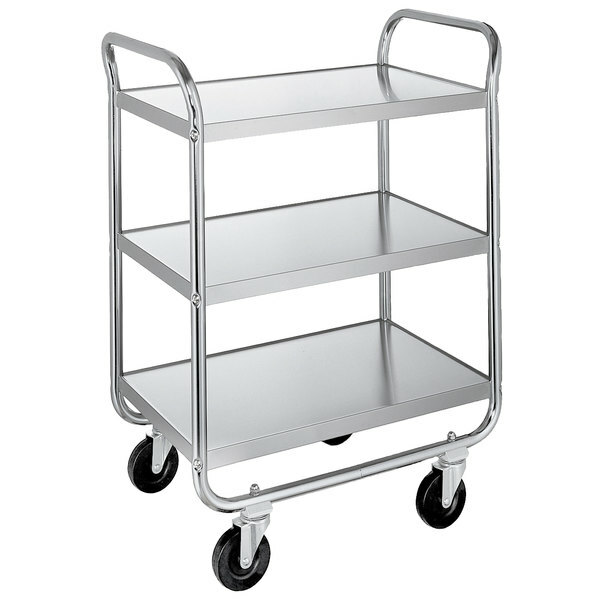 Stainless steel construction, 1" thick tubing, and a U-shaped frame increase the cart's structural strength, in addition to reinforced edges which can accommodate heavier loads. This item boasts three 18" x 27" shelves with a clearance of 9 7/8". A pair of handles are featured on either end of the cart to allow for pushing from both sides when narrow spaces restrict tight turning. 4" swivel casters will maneuver smoothly with less strain. Other design features include chrome-plated legs and frame, which provides your operation with a cart that's not only reliable, but professional in appearance. The Lakeside 489 tubular utility cart is recommended for medium-duty use and features a 500 lb. weight capacity.